I have been feeling pretty good lately, and wanted to share an update in conjunction with the tweaks we have been implementing, outlined in the previous post. Everyone needs to find what works best for them with respect to food. For whatever reason, a few weeks or so back, I had inched back up to 105 pounds, the very high end of what I prefer to weigh. I may have had too much sodium, and retained water. I may of had too many fruits or carbs at once, and retained water. Maybe I just was on a streak of poor elimination. Or, it could be due to increased muscle mass, and shifting body composition. Either way, I felt less comfortable, and more heavy and sluggish. What I am finding within myself, and I encourage you to discover, are the boundaries, or edge where I may cross from intuiting a true need for my body, and making a healthy choice to meet that need, versus thinking I'm intuiting something that may not be the best choice I could have made. It may even start as what I believe to be a craving, say for some walnuts, but upon further tuning in, I make an alternative choice. One day, after my first meal, I began to have an urge for a 'snack' ~ a quick mini meal that requires little effort to prepare that I can consume before my next actual meal. I felt like I needed something that was a little protein, but with fat, so I thought, "hmm, maybe I'll grab a few walnuts, and a tiny piece of 100% dark cacao bakers chocolate, "to take the edge off." In the past I would have had a piece of fruit, like an apple, and some nuts or nut butter. However, since really scaling back on my dietary choices, I have observed that my consumption of fruit and nuts needs to be very monitored. Too much causes me digestive distress, among other symptoms. If I begin to eat nuts at a time I may actually be ready for something more substantial (as opposed to having a few nuts, or some berries at the end of the meal as more of a dessert, for example), then I may end up eating more than will feel good to me. I may find myself grabbing a second, third, and even fourth handful of nuts ~ eating more calories than intended ~ for that snack. This is an especially true phenomena people experience when eating carbohydrates whereby hormones like leptin which help us shut down the appetite are not triggered, and one can eat more calories than needed. So, rather than just grab some nuts, I paused for a moment. I actually grabbed the nearest thing within reach of the kitchen (my keys) that I could use as a pendulum, and inquired if it would be in my best interests to have some nuts for my snack. I got a clear 'No! Upon further questioning, I discerned that a good source of protein was the best choice. Using the pendulum helped me to pause long enough to center myself, tune-in, and make a choice from the 'right' place, rather than mindlessly grabbing something quick, which I may have later regretted. Walnuts are not unhealthy, per se, however, they have been my default snack food. Since eating a very simplified, low-carb diet, I have been more able to recognize that excess consumption of nuts, especially the walnuts, were contributing to my excess sweating, and a little digestive distress. Walnuts are more of a fall/winter food as they are fairly warming. Hence, it's always good to eat more seasonally. Here is what I had instead of several handfuls of walnuts and a little chocolate. This is 125g of smoked turkey drumstick, with a couple radishes, half an orange that was needing to be used up, and some cherries. I like the smoked turkey because it's easy. It's such an ideal food to have around. It keeps well. Travels well. It's a great source of protein with just enough fat. And it goes well with a few crunchy veggies, and possibly some goat or cream cheese, and/or a little fruit. Easy meal. Tastes like a turkey-ham combo. Just carve up a 100g or so, and good to go. Yesterday, I had just 30g of the turkey with a stalk of celery, a couple radishes, and an ounce of goat cheese as a perfect, light last small meal of the day. If you are a smaller female like myself, or are really struggling to lose weight, especially the last 10 pounds, then I really believe making sure each meal centers around a good quality protein source will make all the difference. The author of The Petite Advantage Diet: Achieve That Long Lean Look. The Specialized Plan For Women 5'4" and Under, by Jim Karas, stresses this in his weight loss book specifically geared towards petite woman as well. I aim to get at least 1g of protein per pound of my body weight, or 100g (and even a bit more) protein per day. It provides a nutrient-dense satiety, especially when you pick the best sources of protein. I would say, the ones that you feel instinctively most drawn to eat for any given meal. Ideally, what you choose will make the most sense for your location, or that your ancestors primarily consumed. Many of our European ancestors primarily consumed either a lot of pork, beef, or fish, plus various types of fowl. Various types of fowl and poultry, including goose, plus dairy and eggs eventually became primary staples as well. Many Asians also eat a lot of fish, and pork. Whenever budget allows, purchasing from local farmers is the best way to ensure good quality products, and to make your contribution to better resource management. If you crave red meat, eat it. Don't let the powers that be persuade you into believing that red meat and saturated fats are unhealthy as many claim. Many studies that were done on red meat often used processed meats, which skewed results. There never was legitimate evidence that supported the theory that high cholesterol and high saturated fat consumption increased risk for heart disease, but it was sold as if it were gospel. Red meat is one of the most nutrient-dense foods you can eat. The authors of Life Without Bread, How A Low-Carb Diet Can Save Your Life discuss this in detail. Mostly, I want to encourage clients and those reading this post to make tuning into your body for the answers you seek a habit. Let your own intuition help you determine which are the most appropriate foods to choose at any given time. Perhaps you are craving something other than food? Are you tending to your other needs? What would help you to feel a greater level of harmony, health, and sense of peace, right in this moment? Do your best to go after what you truly need, and most desire in all areas of your life. If you don't have what you most crave on hand, then make a point to get some of what it is soon. If what you most crave is some outdoor time, a healthy relationship, a livelihood that better reflects your needs and values, or a home environment that better resonates with who you really are, and the environments with which your ancestors thrived, then make a point of doing any one little thing that will bring you closer to situations where you feel a greater sense of alignment. All of these things influence your health. With respect to diet, learn to choose all of your foods instinctually. Choose among those foods you know are healthy and appropriate choices for you ~ protein-rich foods, fruits, greens, vegetables, fruits, nuts, and healthy fats, including whole fat dairy products. We aren't talking intuiting needing a bag of cookies here, however, if having a little treat in celebration will bring you joy, then indulge, and don't go into overdrive with guilt. Choose what you know you can feel good about ~ while eating, and especially afterwards. 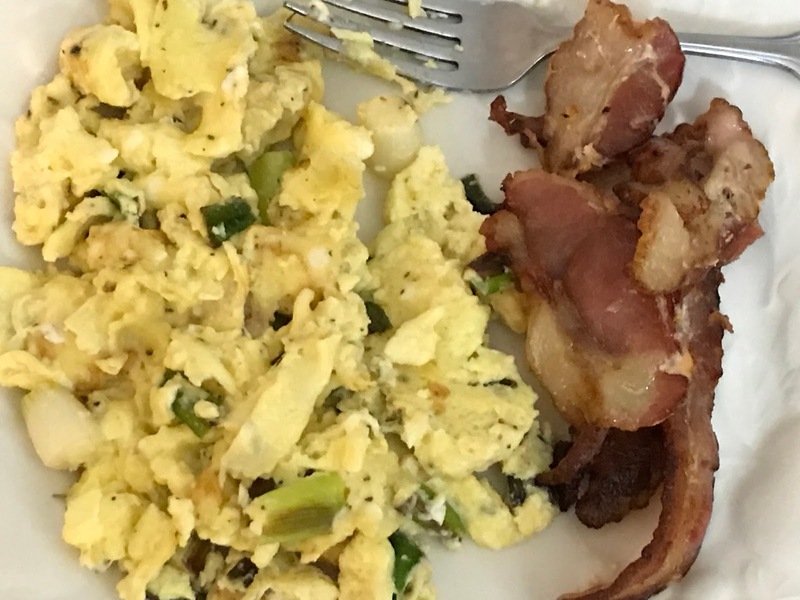 While I am making protein the star of each of my three main meals, I sometimes crave a little more fat some mornings. When I'm craving a little more fat in the morning, I love having some butter or cream in my coffee drink, and then I like to bring on the French Eggs! Too bad the lighting for this photo wasn't great. This was sooo good! 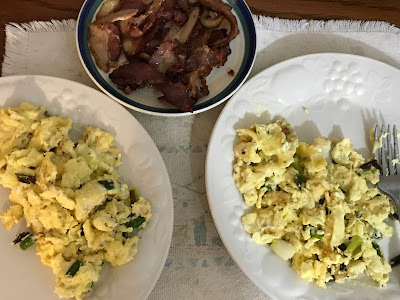 French Eggs ~ Recipe under photo. 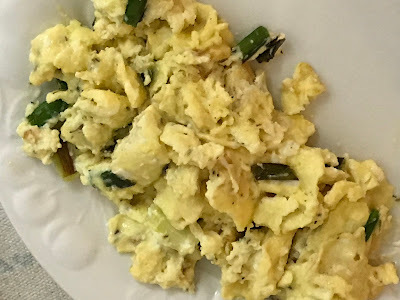 French Eggs Recipe: Scramble desired amount of eggs in a small bowl with a splash of cool water. I used 7 for the two of us. Season with sea salt, a little cracked pepper, and Herbs de Provence ~ or whatever you have that is similar, such as basil, parsley, thyme, etc. Slice up a few scallions, or a leek. Heat your pan, and add butter (or ghee). I used 1 tbsp. unsalted butter for the two of us. Sauté scallions in the pan until they begin to soften and slightly brown. I sometimes also add fresh garlic. Add eggs, then turn heat down to med.-low. Scrape as the eggs begin to cook. Cooking w/ a lower heat, and slower helps them come out really soft and fluffy. Spread 1 oz. of goat cheese (per person) over the eggs. Scrape and cook for just a minute or so longer, until eggs are no longer runny. Delicious! Served w/ TJs Ends & Pieces Bacon. Be fluid with your choices. Take a moment to just talk to yourself, use a pendulum, or do whatever will help you pause just long enough to avoid self-sabotage. Want more fruits today? Have more fruit. Want a huge salad? Have one. Really craving a burger? Make one. Keep it simple when you aren't craving much else. Have more produce on a day after having very little. Trust your self! We had cooked up a fresh batch of chicken bone broth using a whole organic chicken, priced to sell at a local market. It made nearly 1 gallon of broth, and netted a good amount of chicken meat which I saved separately after straining the bones and veggies from the broth. We enjoyed a few days of chicken meals, adding some back to the broth with some additional vegetables, tomatoes and spices to make a nice meal out of the soup, along with a side salad. 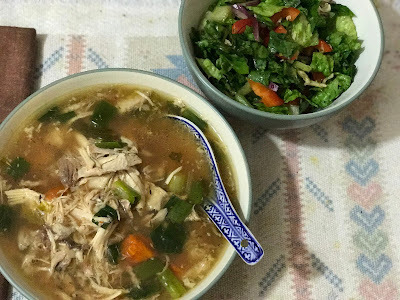 We just so happened to have perfect timing for this soup which coincided with a few days of cooler, rainy weather, a real treat for us this time of year! flavor, plus additional B vitamins and amino acids. Very delicious soup! When we buy radishes, we salvage what we can of the radish greens to have as a salad. the veggies down, and actually makes it easier to eat. It tastes good too. Of course, after a few days of chicken soup, the last thing we wanted was more chicken. I'm sure you would feel the same way! It's natural. Our body gets what it needs from certain foods when we really crave them, then when we've saturated ourselves, we are done. I had this intense need to eat blueberries last season and was loving them. Then, it seemed like they just quit tasting as good. Both the season, and my craving ended at the same time. I believe we are intrinsically wired to be in tuned to nature's rhythms, but have allowed ourselves to be programmed otherwise. Yesterday I was really craving salmon. I wanted it for breakfast. However, it was easier for us to just make a quick protein drink, post strength training session, so we could head out to the pool before it got much later and hotter. Again, I was ready to start cooking, but pausing for a moment, this time with Don's input helped me make another plan that worked out great for having three nicely timed, protein-rich meals. Yes, I am drinking raw eggs, made like an eggnog, or thereabouts. My Protein Shake: 2 raw eggs, 3 Tbsp. _ 1/4c liquid egg whites, 2 oz. dec + reg. coffee made in a stove top espresso maker, 1/4 tsp. cinnamon, and some heavy cream. Also good w/ half and half, and a little apple juice instead of the espresso. Blend. Enjoy. Keta (Chum) Salmon & Curried Cabbage: Place filets on a plate, and squeeze a wedge of orange on the salmon. Season w/ a little sea salt, and a pinch of cayenne. Let sit a few minutes or more in the fridge. When ready, heat pan. I cooked in our non-stick griddle pan that still had yesterday's bacon grease on it. Fry both sides, until fish flakes w/ a fork. While the fish was cooking, I cooked it w/ the veggie relish. Dice some red onion, and red bell pepper, and 1 small peach. Cook in the same pan, as it is great in the bacon fat. Add a bit more sea salt, and optional curry powder, which went well w/ this dish. Separately, cook cabbage cut into fettuccine noodle shapes in a blend of butter and coconut oil. Season w/ a little curry powder & sea salt. Add a splash of water, cover & let cook on medium until desired doneness. You can also add 1-2 tsp. nutritional yeast if desired. For the following, third meal of that day, we had a delicious, well seasoned burger ~ with sufficient Celtic grey sea salt and garlic powder, plus a little pepper ~ that was very satisfying. I love just adding ketchup, & the nice sweet veggie relish made by a neighbor. We enjoyed that with a little fermented cabbage, and the remains of the cooked cabbage from our salmon meal. Since our burger was eaten before heading to our clinic at around 3:00, I had a final snack of 30g of smoked turkey, goat cheese and veggies, which was a perfect last meal of the day, eaten around 6:00. These smaller, simple meals helped me feel satisfied, and perhaps because of eating more frequently, I am sleeping better too. Keep trusting as this process will guide you to learn how to really trust your self. That is the goal. It is applicable to all areas of your life. Learning to 'feel' and 'sense' messages coming to you takes practice. Some may have a knowing, but may question that knowing. Learn to trust what you sense. Give the skeptical, doubtful part of your brain a break. When we trust in and act upon our inner (albeit subtle) guidance, we usually are rewarded in some way, however small and unnoticeable it may be in that moment. If we can use this journey to find our ideal way of eating ~ which perhaps is an ever changing pattern more than a set of rules set in stone ~ it will build our spiritual muscles, helping us trust ourselves to really implement the good, juicy stuff in life. The more we follow the crumbs ~ or the smoked turkey leg, or the salmon, burgers, awesome French scrambled eggs, crunchy vegetables, or juicy, seasonal fruits to our greatest satisfaction and health ~ the more self-confidence we will develop from learning to really really trust ourselves. The more we live with congruence to our greatest desires, and that with which we most resonate, the lighter, healthier, and happier we will be and feel. This is how we more fully embody what has always been there ~ our true selves ~ in all our glory. Friday evening meal: More burgers! This was made w/ grass-fed ground pork & beef combined. Seasoned w/ sea salt, black pepper, garlic powder, and a hint of ground rosemary. Grilled onions cooked in pan w/ the morning's bacon drippings ~ as per usual! Fermented cabbage, and sweet relish, ketchup & spicy mustard on burgers. Envisioning manifesting our true desires w/ a vision board collage. waist measures 25 & 1/4 inches. It was either 26 or 26.5 near the end of the plant-based days. My prince is looking great! Main improvements: Don losing weight eating 6-9 eggs per day, plus plenty of fat. His waist is at a near life-time smallest. Yet, he was putting weight on, which he wanted. This means he is losing fat, and adding muscle. Both of us have much brighter complexion (although not really seeing it in me in those pictures.) My hair is much shinier as well. I even just noticed that I don't have rough scaly elbows anymore. I don't recall my elbows ever being so smooth! Body recomposition takes a little time. And, for me being smaller, the actual fat loss seems slow, however, I'm eating in a satisfying way, and I know I'm getting stronger with our strength training, so, there is no real hurry. I'd rather do it safely, and comfortably.